Guy Rigby has been a regular blog contributor to HOTELSMag.com since Feb 2013. When HOTELS invited me to come up with a subject for a regular blog I immediately knew I wanted to share some of the amazing experiences I have around food and beverage as I travel around the world. Whether the experience is good or bad, I always see it as a lesson learned. I booked a room for one…. not me and three cockroaches! My first musing for the new year is about problem resolution. And in fairness, this can be directed equally at F&B managers and front desk/guest service managers. My final trip for the year was to New York to conduct a training course. My client had booked a room for me in a hotel that had opened in the last year or so. The staff were super friendly and while the room was small it was well equipped and comfortable. But without double glazing the noise from NYC traffic woke me at 3am and I trudged to the bathroom where I was greeted by a small American cockroach creeping toward my wash bag. I disposed of it quickly and returned to my bed where I found another cockroach crawling up the nightstand next to my bed and 6 inches from my pillow. And of course they weren’t alone as I then found another in my shower a couple of hours later. As my room was on the 17th floor I can only imagine how many others were hiding in the building. I called to speak to the GM in the morning but was connected to the assistant guest services manager, who was sympathetic and apologetic. She offered to send me some coffee, asked if I wanted a late check-out and said she would remove the facility fee from my bill. I told her I was not looking for any kind of discount, I was just wanted to ensure that immediate corrective action would be taken as this was a serious problem. In most cases the hotel would say it had done its job. It had listened to my problem, shown empathy and offered me something for free. Boxes checked! Problem resolved. This is where a hotel can differentiate itself. Cockroaches are a fact of life in hotels and restaurants, but people hate them and will avoid your establishment like the plague if they know the place is infested. Any comment to any employee about such a complaint should trigger a HUGE red flag. The assistant guest services manager knew what time I was checking out and she should have alerted the front desk to call her or a senior manager when I was at the desk so they could meet me in person and once again apologize. And a follow-up email or call from the GM should have been received assuring me that this serious issue was being dealt with immediately. THEN – the story becomes how “well” they dealt with it and not what happened. Fortunately for this hotel, I am not one to post negative comments on social media. But what if I was…! But as a hotel leader… Are you really getting kids right? "Oh yes, we have kid’s menus and we give them crayons and a coloring book.” Is that enough?? We all recognize that when a hotel or a resort gets kids right, the parents are SOOO happy. Hours are invested getting kid’s activities right, and in so many cases they do an amazing job. But more often than not, kids’ menus lack inspiration and creativity. As resort restaurants become more casual and approachable and grab-and-go cafes are popping up everywhere, it’s more important than ever to get kids right when it comes to food. What do they love to eat the most, and how can you explode it, take to it the extreme and blow them away? If it’s a hot dog, how many different kinds of hot dog do you have on your menu and how is the presentation? Is it “LIKE… AWESOME!!”? Is it Instagram or Snapchat worthy? And to get an idea of how much can be done to a basic hot dog, just look at what the creators of Japadog did: Twenty-seven kinds of hot dog and six kinds of “shaked” fries! And when it comes to ice cream... imagine arriving at a resort and finding the kinds of soft-serve creations dreamed up by the Toronto-based company Sweet Jesus – Krusty the Cone and Hella Nutella are two of my kids’ favorites. For kids, SO much is about aesthetics and creating the WOW with presentation. When in Maui a couple of weeks ago, we had an amazing dinner at Ferraro’s at The Four Seasons. We ordered their number one-selling dessert, Milk Chocolate Budino. The presentation was fabulous and of course both my girls took a video and immediately shared it with their hundreds of friends on Snapchat. Ask them what they remembered most about the dinner (and every dish was fantastic! )… of course they’ll tell you it was the dessert! With great respect to bartenders around the world, it’s time to recognize the importance of bar food. Too often, we see the same old uninspiring dishes on a bar menu… charcuterie and cheese board, chicken wings, chips and dip, fries, nachos, etc., etc. It’s not that I have anything against these very popular dishes. But if you have them on your menu they must be AMAZING! At Bar Buca in Toronto we ordered Burrata di Buca, pesto-stuffed mozzarella with gremolata and anchovies served with grilled sourdough bread. We devoured it. At DBar in Toronto we shared the charcuterie board. Daniel Boulud works with renowned master charcutier Gilles Verot. The selection might include Paté Grand Pere (coarse pork paté with foie gras, truffle and cognac), Fromage de Tête (braised pork cheek and snout set in a pork jelly), Duck aux Agrumes (a jellied terrine with braised duck leg, lemon, orange and grapefruit), Paté en Croute (pork, figs and duck breast), Chicken Liver Mousse and Saucisson Sec (dry pork sausage with black pepper, garlic and red wine). At the Fairmont Pacific Rim in Vancouver, British Columbia, I sat in at the raw bar overlooking the packed, vibrant lobby lounge and ordered from a sushi menu most Japanese restaurants would be proud of. As more and more people are choosing to eat dinner in a bar, differentiating yourself with a high-quality, well-executed bar menu will give you a competitive advantage. Additionally, as beverage is typically your profit-driver, retaining your guests for longer periods will increase your revenues and bottom line. I didn’t even have time to react. I’d just finished my gravlax. I was taking another sip of wine. And then wham! Down it went. “With the compliments of the chef,” she said. As soon as I saw the ubiquitous martini glass and the festering blob of mush I knew. I checked with my guest – how many courses did we order, eight? No – two. Had Uber taken us to the Palace of Versailles by mistake? I couldn’t see any white gloves… only blue jeans on the servers. Now I had to get creative. It was too late. I was unprepared. I didn’t say that but I should have. And my point is… Would chefs kindly cease this ridiculous habit of serving sorbets in the middle of a simple meal? It’s pretentious and not relevant. There are many ways to enhance a great meal. An engaging smile and a brief visit to the table from the manager would be at the top of my list. But never a limoncello sorbet! Occasionally a restaurant comes along that is about so much more than the food or the beverage or the decor. It’s about what it stands for and the good it does for the community. 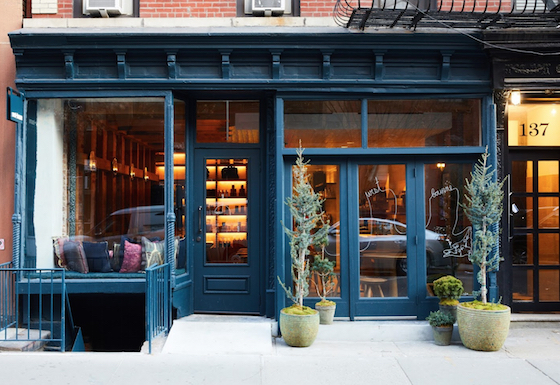 West-bourne opened recently in New York City’s Soho neighborhood. As hotels look to connect with millennials yet differentiate themselves from their competition, giving back to the community and focusing on shared values might just be the key. Bravi! to Camilla and her team for leading the way!